You usually don’t wake up this early on vacation. When you see the sun rise, it’s probably because you stayed up all night. Not today. This morning, it was still dark when the alarm on your phone started buzzing. You pushed snooze, but only once. Then you forced yourself to get out of bed. You quickly brushed your teeth, dug a bathing suit and shorts out of your suitcase, and started driving east from Christiansted. A half an hour later, you reach the eastern end of St. Croix. The black sky is starting to turn shades of gray, and a few low-hanging clouds are drifting north toward the other U.S. Virgin Islands. You see two other cars when you park, but no one is in sight. You have the Millennium Monument—a stone sundial built for 2000’s New Year celebration—all to yourself for a few minutes. Then you follow the rocky, cactus-lined trail down to Point Udall as the sky lightens from gray to purple. 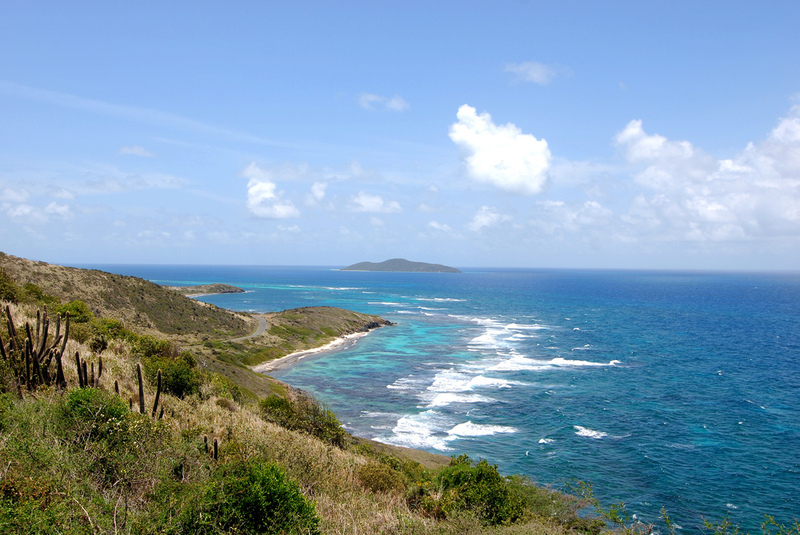 Point Udall is the easternmost point on not only St. Croix, but in the entire United States. Many people give that distinction to West Quoddy Head, Maine—home to an often-photographed red-and-white-striped lighthouse—but that’s just on the mainland. Once you include the territories, Point Udall is the farthest east you can travel. This time of year, you’d rather be on St. Croix than in Maine anyway. But back to that imminent sunrise. The purple sky is now bright blue with streaks of pink along the horizon. Waves are crashing onto Jack and Isaac Bays below you. Goat Hill and the rest of St. Croix are behind you. The turquoise Caribbean Sea practically surrounds you. While a bright yellow fireball is suddenly rising in front you at exactly 6:49 a.m.
It’s only after the sun has risen high enough—when it starts to feel like a normal day instead of a magical morning—that you begin to think about the rest of your day. Breakfast, which you packed last night, on the beach sounds like a good start. You hike farther south to sit on Isaac Bay. The white-sand beach is deserted. In a few months, green and hawksbill sea turtles will take over the beach to nest. But, right now, it’s all yours. You’ll snorkel among blue tangs and sergeant majors, staghorn coral and conchs. Then you’ll follow the trail to Jack Bay, once you no longer have the beach to yourself, and let the salt air and the small waves lull you to sleep. Your second reward for waking up so early is a beach nap.